Which squirrel will take the bait in the world's first round of squirrel fishing? And how many chocolate pies can a man in a shopping cart jump over? Find out in Banzai™ - The DVD Board Game by Screenlife. It is a betting game where people bet plastic sushi on the outcome of bizarre Banzai stunts from the hit TV show of the same name. All you have to do is to fill the betting bowl with fake sushi pieces using only chopsticks. The winner controls the betting, but the DVD controls the outcome. Whoever wins all the sushi wins the game! Visit www.myspace.com/takotheocto and met Tako the Octopus. Well, the game is perfect at parties, festive gatherings, get-togethers, bar mitzvahs and did I say parties? Kanpai! It brings the absurd hilarity of the hit show home! Laugh, place your bets and party with your friends as you bet on Squirrel Fishing, Mr. Shaking Hands Man, Insect Roulette and much, much more. Now, it is available for purchase online! 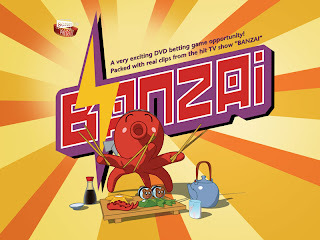 Banzai comes with a DVD, 4 sushi bowls, 1 community betting bowl, 20 lettered cards (for betting on the multiple-choice questions), 100 assorted sushi pieces, 4 pairs of chopsticks, 4 Hachimaki (headbands), and the instruction manual. It is recommended for 2 to 4 players or teams, ages 16 and up. So, what are you waiting for? Players, are you ready? Get your chopsticks ready! Hope this game is kids friendly because I am going over to my brother's house and will bring this game out when the kids are around for them to enjoy the time.